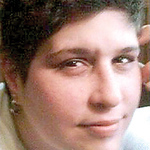 Christine Gingras, 41, of Bristol, Conn., lost a long battle with cancer Thursday, Oct. 25, 2018. Christine is survived by her wife, Nina Gingras and her son, Kain Torres, her mother, Linda Elia Gingras and father, James A. Gingras, all of Bristol, her aunts and uncles, Jo Martinez, Daniel Martinez, Richard Gingras, Cynthia Gingras Ramona Fisher, and many cousins and friends. Christine was predeceased by her brother, James J. Gingras. A Celebration of Christine’s life will be held Thursday, Nov. 1, 2018, at 7 p.m. from the Paul A. Shaker Funeral Home, 764 Farmington Ave., New Britain, with the Rev. Pouls Namrood, presiding. Relatives and friends may call at the Paul A. Shaker Funeral Home Thursday, from 5 to 7 p.m. To extend condolences to the Gingras family or to share a memory of Christine, please visit shakerfuneralhome.com. Posted in New Britain Herald, on Tuesday, 30 October 2018 20:49. Updated: Tuesday, 30 October 2018 20:52.